The main camera on the LG G2 has a 13MP sensor that captures photos with a maximum resolution of 4160 x 3120 and 1080p videos at 60fps. There's also a 2.1MP front-facing camera that, too, shoots 1080p videos. The interface has been remodeled since the Optimus G Pro, but retains a similar controls layout. You get a bar on the right with the still/video toggle, a virtual shutter key and gallery shortcut on the right and a column with four shortcuts on the left. The top shortcut toggles between flash on/off/auto modes, the second one switches between the front and back cameras, the third gives you access to a selection of different camera modes, and the last one is a Settings shortcut. You can pick between one of twelve shooting modes - Normal, Shot and Clear (erases something from a picture), HDR, Panorama, VR Panorama (Photo Sphere shot), Beauty shot, Dual camera shot, Night scene, Sports, Time Catch shot and Intelligent Auto mode, which automatically selects the right scene. The Time catch shot feature (also called Time machine camera) snaps a photo, but also records several photos of what happened before you hit the shutter key. You can save any of the photos on that list that you like. The image quality of the photos shot with the LG G2 is excellent. Photos have a lot of fine detail and very little noise. Pixel peepers will notice oversharpening halos, but it's nothing drastic. Colors are very accurate, the white balance is great too. Overall the G2 does some great photos and you can see that for yourselves from the samples below. We took a few HDR shots as well. Once again the LG G2 does great samples. Here is a panorama shot taken with the LG G2. It does the stitching well, but the resolution and the quality are really disappointing. The Galaxy S4 does 60MP panorama shots, while the G2 settles for 5MP! The low-light camera samples looks very good too, though in full resolution you'll notice the drop in the resolved details due to the noise reduction. Despite that, the samples are great in those light conditions and will make for some good pictures once downsized. Finally, we took a few shots in the night, but as you can guess there is very little detail in those and are completely useless. We took a shot in a pitch-dark room in order to test the flash. The LG G2 shot a great photo with plenty of detail. We did a few other tests too and we can confirm the G2's flash is great for up to four meters of distance and would do for close-quarter group shots. The LG G2 faces off with the 13MP flagships in our Photo quality compare tool. You can see the LG G2 is on par with Samsung's Galaxy S4 producing great amount of detail, accurate colors and excellent contrast. What came as a disappointment for us is the fact that even though the LG G2 is able to capture still shots while recording video, it only produces images with 1 megapixel of resolution. There are a few interesting modes available in the camcorder - Normal, Dual-recording, Live Effect and Tracking Zoom. The LG G2 can record 1080p videos at 30fps with either camera. It can also record with botch cameras 720p@30fps - that's the Dual recording mode. It looks a lot like video calling with the video feed from one camera filling the screen and the other shown in a small window. You can tap the viewfinder to swap the cameras, even during video recording. Here is a 720p@30fps sample of the dual-recording feature. The Live Effect videos are shot in 480p and alter faces in real time. There are six types of face altering - big and thin eyes, big and small mouth, big nose and squeeze face. We did try all of them and we did snapshots to give you the idea of the quality and the effect. The last mode is Tracking Zoom. This one uses a small resizable and moveable windows which shows you a zoomed area of the video you are shooting. You can move both the zoomed window and the place you are zooming on. We've prepared a short 720p sample (that's the maximum resolution) for you to check out. Finally, there is a feature called Audio Zoom. While you are capturing a video you can zoom on a person or an object and the G2 will capture its sound only. The picture zooms with the audio zooming too. We tried this feature but the results were quire disappointing. 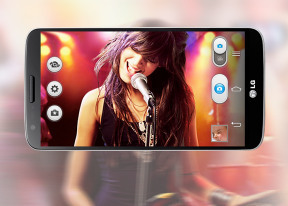 The LG G2 main camera is capable of shooting 1080p videos at both 60 and 30 fps. The 60fps videos are actually shot in 58fps, but we guess that's the best G2 can do. Both videos are stored in MP4 files with a bitrate of 20Mbps for 1080p@30fps mode and 30Mbps for the 1080p@60fps. Audio is recorded in stereo at 156Kbps and a sampling rate of 48kHz. Those are some impressive specs on paper and the actual results are great too. The videos are smooth at 30fps and 60fps with great deal of resolved detail, lively colors and excellent contrast. There are no visible defects. Unfortunately, the continuous autofocus is goes off way too often if you are shooting moving objects. The automatic exposure is too sensitive too, though it does a better job. And since there is no way to lock the focus or the AE some videos might get ruined because of that. The LG Optimus 4X HD, Optimus G and Optimus G Pro all had this problems and still LG left the same issue made its way on to the G2. The optical stabilization works its magic great and will improve the videos you've shot on the move. Check out this FullHD video sample at 30 fps from the G2. You can also download this sample, taken straight from the phone. We've also prepared a 1080p@60fps sample for you. Since there is no online service to support 60fps upload, you must download the video. If it wasn't for the trigger-happy continuous auto-focus, the LG G2 camcorder would have been the perfect one. Now, it's only great. The LG G2 shoots 1080p videos with its 13MP camera. Check out how it stacks up against other 13MP / 1080p shooters and also 8MP / 1080p cameras. In terms of resolved detail, color accuracy and contrast it beats even the Galaxy S4 in good light. In low light, the two are pretty much even.